I've got so used to this series of Doctor Who being made up of two-parters I wasn't really prepared for this week's to be a standalone. I'm still not convinced next week's apparently unrelated episode won't turn out to be some sort of sequel after all. 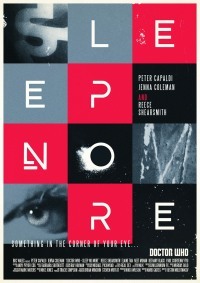 "Sleep No More" by Mark Gatiss, directed by Justin Molotnikov. Spoilers after the cut. I don't think I really get this episode, and it may be because the much-trumpeted "found footage" gimmick it was built around didn't come across that well. The thing is, the camerawork might have been a bit shakier than usual and static occasionally flashed across the screen (in what turned out to be a plot-significant way) but otherwise the picture quality was pretty much the same as every other week. So the whole Blair Witch meets Ring atmosphere it was meant to evoke had no chance of establishing itself. It was darker than usual, literally, but that only really managed to make it hard to work out what was going on, not actually add scares. Still, Reece Shearsmith was reliably creepy, and I like the little fact the Radio Times figured out, that in finding a role for one of the other League of Gentlemen members, Gatiss waited until Series 9, Episode 9 for the co-creator of Inside Number 9.